The Company has placed a high priority on creating a secure serviced offices in Southwark. An entry - phone system is located at the main entrance and is connected direct to each unit, so visitors would call your serviced office direct and you would give them access. The building is also protected by remote monitored intruder alarms and remote monitored CCTV. Secretarial services available by the hour as well as photocopying, incoming and outgoing faxes. Free connection to our advanced digital telephone network. We can offer a wide range of services including Voicemail, ISDN to the desk and divert to PSTN. The architects have succeeded in retaining the stylish features of the original Victorian building whilst creating additional modern units, comprising of more than 31 Southwark serviced offices. 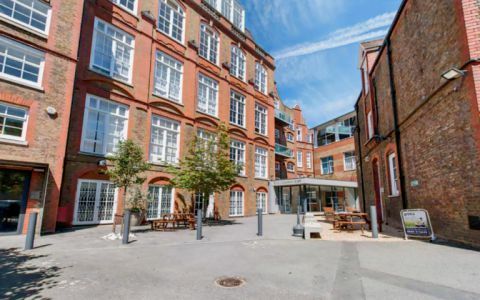 The Southwark serviced office consists of three buildings set in a courtyard, less than 10 minutes walk from Waterloo Station and even closer to Lambeth North Underground Station. The area has a variety of local amenities and many good transport connections making this an excellent location for any business. Easy Offices Where is the nearest public gym to Westminster Bridge Road? Easy Offices Where is the nearest coffee shop to Westminster Bridge Road? Easy Offices Where is the nearest place to get lunch near Westminster Bridge Road? Easy Offices Where is the nearest car park to Westminster Bridge Road?